When I was in NYC a couple of weeks ago, I went to a salad shop near our hotel for lunch a few times. It was one of those places that you pick what you want and they chop it all up for you and you’re on your way. They also had quinoa bowls. In fact, I noticed just about every lunch place I walked by was advertising quinoa bowls. I never had one, but got to thinking they must be pretty darn good if everyone is offering them. I think it must be the new trend. Or maybe not, maybe I’m just late to the party. Anyways, that’s what inspired me to make this Mexican Quinoa Bowl with Chipotle Vinaigrette over the weekend. If I still had kids at home I betting they would love creating their own quinoa bowls for dinner. It’s a great way to serve up some Mexican fare that each family member can customize to their liking. It’s also a really great way to serve food for a party! I’m all about easy when it comes to entertaining. I used my favorite Carnitas recipe for the meat, but you can use whatever protein you prefer, or leave out the meat altogether and make it vegetarian. Endless possibilities. I cooked up some quinoa for the base (try rice if you’re not a quinoa fan) and chopped up a variety of veggies to go along with it. Again, use what you like or have on hand. I had some nice tomatoes from the farmer’s market, an avocado and a couple of ears of corn. I really like to grill my corn and since I don’t have a BBQ available right now I just did it on my grill pan on the stove. Popped open a can of black beans, chopped up some cilantro and crumbled some queso fresco and that was about it. Here’s the deal… The ingredient that really makes this quinoa bowl OUTSTANDING is the Chipotle Honey Lime Vinaigrette. That stuff is soooooo good! The chipotle puree gives it a smokey spice that’s balanced out with some sweetness from the honey and the lime gives it just the right amount of acidity. You really need to make up a batch and put it on EVERYTHING. I’ve bragged about this vinaigrette before…you can get the recipe here. 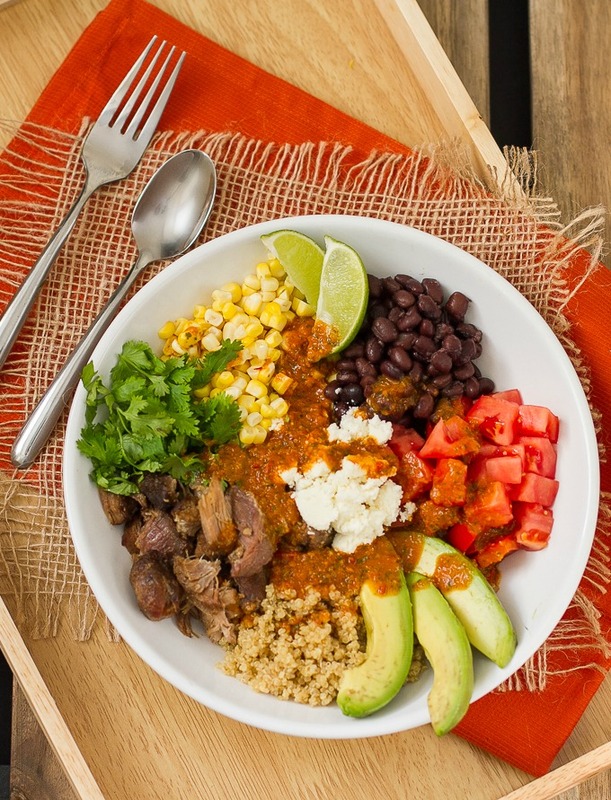 Mexican Quinoa Bowls with Chipotle Vinaigrette…it’s what’s for dinner tonight, (again)! 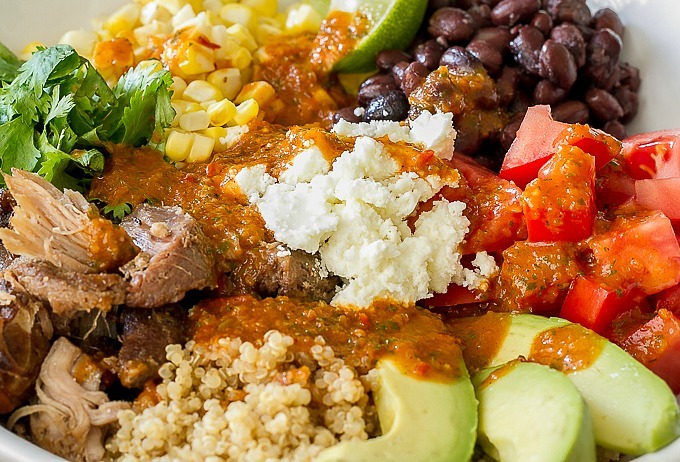 Quinoa bowls are great to serve for parties or dinner for your family. Everyone can pick and choose what to put in their bowl. These ingredients are just suggestions...use your imagination to customize a quinoa bowl to your liking! Prepare Carnitas or other protein, if using. Cook corn. I like it grilled but you can cook however you prefer. Slice kernels off of the cob and set aside. Dice tomatoes and avocado (squirt with lime to prevent browning). 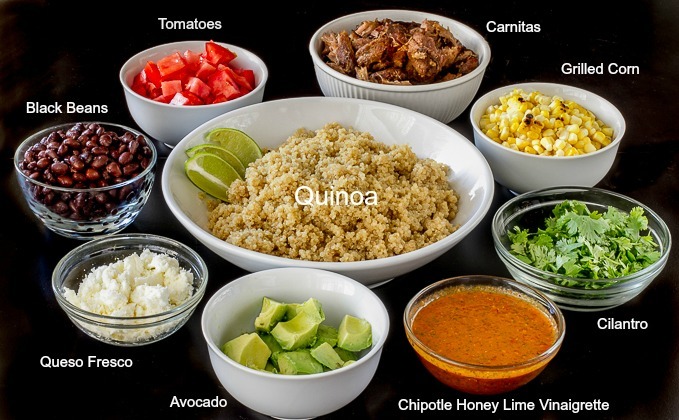 To assemble: Place some quinoa in a bowl, top with the toppings. Drizzle a good amount of vinaigrette on top. Consequently mouth watering! That seems to be amazing! This looks like the perfect salad. I love quinoa and mexican flavours, but i’d never thought of pairing the two together before. I’m definitely going to have to try this! I hope you try it and like it! The chipotle vinaigrette is what makes it really goooooood!